JS Shoryu (SS-510) during its commissioning ceremony last 18 March 2019. Photo c/o KHI. The Japan Maritime Self Defense Force (JMSDF) recently commissioned its latest Soryu-class diesel-electric attack submarine. 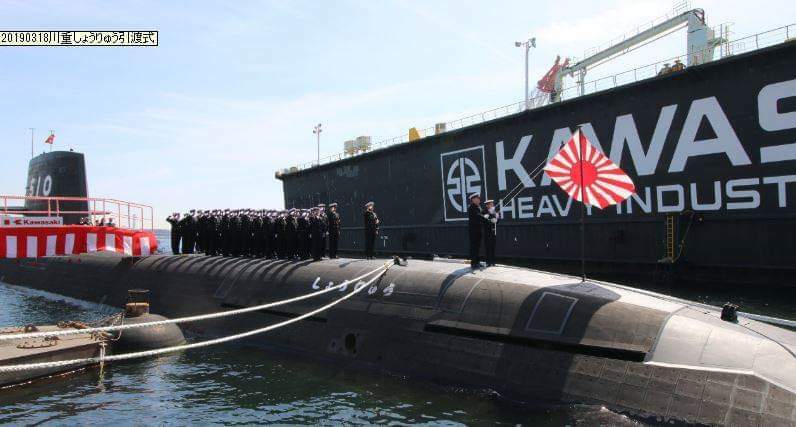 The JS Shoryu (SS-510) was commissioned on 18 March 2019 in ceremonies held in Kobe, Hyogo Prefecture. It was then assigned to the JMSDF's Submarine Flotilla 1 based in Kure Naval Base in Hiroshima Prefecture. The ship is the 10th Soryu-class submarine and was built by Kawasaki Heavy Industires in Kobe. Shoryu means “Soaring Dragon” in Japanese. It was estimated that the total cost to acquire the submarine is around JPY56 billion (US$502 million). The JMSDF’s 84-meter long, 2,950 ton Soryu-class are considered as the world’s largest conventionally-powered submarine, and are equipped with air-independent propulsion (AIP), enabling them to stay submerged for extended periods of time. It has a crew of 65 men, and has a maximum speed of 20 knots.